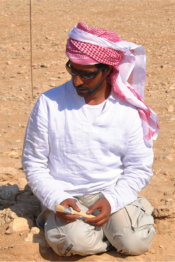 Faisal Abdulla Al-Naimi has been enthralled by archaeology since boyhood and would travel around the desert noting the places where for centuries his bedu ancestors had camped. If he found a flint arrowhead he would think about the man who made it thousands of years ago and feel his connection with the long history and pre-history of his country. For the past 22 years he has undertaken survey, excavation and recording for the Department of Antiquities . He studied lithic technology in France, where he learnt to knap flint. Later, he worked in Syria as a lithics specialist for the French mission and has worked on excavations in Kuwait, Tunisia, France and Qatar. In 2006, Faisal became Head of the Department of Antiquities, bringing a wealth of experience to the management and protection of heritage sites in Qatar. He has been instrumental in setting up Qatar’s first national database and Geographic Information System for heritage management, the Qatar National Historic Environment Record [QNHER], which has now surveyed and recorded more than 5,000 monuments and archaeological sites. He acts as a cultural representative for the Qatar Museums Authority, is Qatar’s envoy for antiquities on the Gulf Cooperation Council and is the spokesperson on heritage issues concerning UNESCO in Qatar. Faisal Al-Naimi frequently visits schools to teach and conduct workshops. His wish is that young people should have the opportunity to discover the rich heritage Qatar has to offer.